A moist and rich chocolate masterpiece! This is the perfect birthday cake for a chocolate lover. 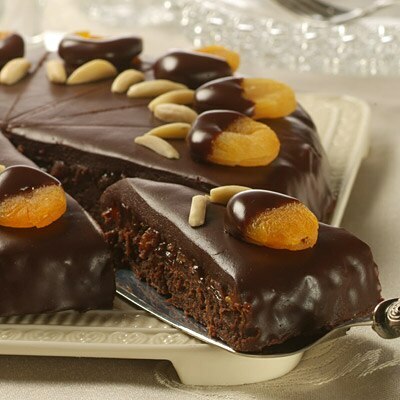 The chocolate filling combines chopped apricots in a fruit filling that is topped with a decadent chocolate ganache garnished with apricot fans. This 1st Prize winning recipe was designed and created by Julie Nealey of Edmonds, WA. PREHEAT oven to 325° F. Tightly wrap outside bottom of and side of 9-inch springform pan with 2 pieces of foil to prevent leakage. Grease springform pan and dust with cocoa. COMBINE morsels, butter and sugar in small, heavy-duty saucepan. Cook, stirring constantly, until chocolate is melted. Remove from heat. Stir in eggs and vanilla extract. Stir in cocoa and flour. Spoon into prepared springform pan. Place springform pan in larg roasting pan; fill roasting pan with hot water to 1-inch depth. BAKE for 60 to 65 minutes or until cake is set. Remove springform pan from water bath to wire rack. Cool completely. Run knife around edge of cake. COMBINE apricots, bourbon, sugar, water and lemon juice in small saucepan. Bring mixture to a boil. Reduce heat to low; cook for 20 minutes, stirring frequently, until liquid is evaporated. Cool completely. Spread over top of cake. Refrigerate for 1 hour. HEAT cream in small saucepan over medium-high heat to boiling. Remove from heat. Add morsels and corn syrup without stirring. Let stand for 5 minutes. Stir until smooth. Add butter; stir until smooth. Place cake on wire rack over a baking sheet. Pour ganache over top and sides of cake to cover completely, saving a small amount of ganache for garnish. Reheat ganache if necessary to pouring consistency. (Ganache must be warm to pour evenly over cake. Do not spread ganache with knife, as it will leave marks.) Refrigerate 1 hour or until ganache is set. Transfer to serving platter. CUT apricots into fans by cutting slices 3/4 of the way through. Dip cut ends in ganache. Place around top edge of cake. Arrange 2 almonds in V-shape at base of each apricot. Refrigerate for 1 hour. Allow cake to stand at room temperature before serving.